Coming up with a great breakfast or brunch dish can be a challenge. 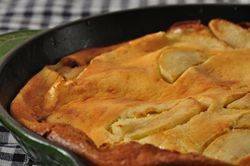 One dish that doesn't get a lot of attention these days is an Apple Popover (often called an Apple Pancake). Although we normally think of popovers as muffin-sized, for this Apple Popover we are going to make one large billowing popover combining a pancake- or yorkshire pudding-like batter with slices of cinnamon sugared apples. Because it is baked in a hot oven the outside becomes wonderfully crisp and golden brown, yet inside it has a soft moist interior that is oh so light and tasty. Looking at this Apple Popover recipe you immediately know it is not a normal popover. What makes it so different, other than its size, is that it starts with sliced apples that have been sauteed and lightly sweetened with cinnamon sugar. The sauteed apples are then covered with a batter, that is simply made in your blender or food processor (can also use an electric mixer). The Apple Popover is baked in a very hot oven and as the batter bakes it puffs up and eventually turns a beautiful golden brown color. While the outside of the popover becomes nice and crispy, you will find that the inside remains soft, almost custard-like. It is important, though, not to open the oven door while it is baking, as the batter may collapse. This dish needs to be served as soon as it comes out of the oven, as it starts to deflate right away. Lovely with a dusting of confectioners sugar and a dollop of softly whipped cream or yogurt. Apple Popover: Preheat the oven to 425 degrees F (220 degrees C) and place the rack in the center of the oven. Apples: In a small bowl, mix the sugar with the ground cinnamon. Then in an 8- or 9- inch (20 or 23 cm) heavy ovenproof skillet (preferably nonstick), melt the butter. Add the sliced apples and sugar mixture and sauteed the apples just until tender. Popover Batter: Meanwhile, in your food processor or blender (can also use an electric mixer) place all the batter ingredients. Process for about one minute, scraping down the sides of the bowl as needed. Once the batter is completely smooth, pour over the sauteed apples. Bake for about 18-20 minutes or until the popover is puffed and golden brown. Do not open the oven door until the end of the baking time or it may collapse. Serve immediately with a dusting of confectioners sugar and softly whipped cream, vanilla ice cream, or yogurt.